Thank you very much for stopping by lancefisherfishing.com. It’s because of you and a passion for fishing that allows me to spend days on the water as a fishing guide. Over the years I’ve been blessed to host thousands of fishing charters and guided fishing trips, both private and corporate. So whether you’re inexperienced, seasoned, young, or old, you’re welcome on my boat. 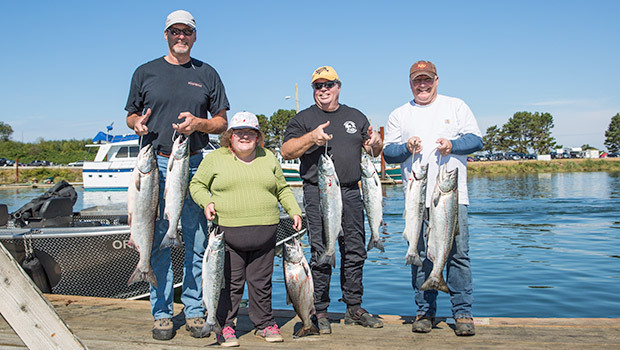 Astoria, Oregon– Home to Buoy 10 Salmon Fishing, world class ocean salmon fishing and sturgeon fishing. Portland, Oregon– From here we fish the Willamette for Spring Chinook, Bonneville Dam on the Columbia River, the Columbia River Gorge and locally the Clackamas and Sandy Rivers. The great thing for fishermen here in the Pacific Northwest is that we have year around runs of Salmon, Steelhead, and Sturgeon. Some months are certainly better than others, but to enjoy such an abundance of different types of fishing trips is certainly special. Some of the top runs on the continent exist on the Columbia River and within the states of Oregon and Washington. Because of this, you have many choices from which to choose. I want to make sure that you end up with the trip or trips that best suit your needs and desires. I’ve spent the last decade developing a guide/charter service that people can really enjoy. Equipment matters, and my family and I have gone to extensive lengths to make sure that my clients are fishing in and with the very best equipment available. From the state of the art 25′ Willie Raptor, to the top of the line G. Loomis rods and Shimano reels- great fishing equipment, along with the available fishing makes for great days on the water together. Have a look around and feel free to contact me by phone at 971.401.0521 or contact us with any questions or to book a date.